I love the glorious simplicity of a sunny, pleasant day where a cool breeze amidst sunny rays refreshes the senses with the noxious delights of creation. It's days like this that cause me to sneeze a lot the following day from all of the emphatic inhaling. In such climatic splendor I found myself in one day within Lancaster, PA. En route with a moderate entourage, we were basking in the euphoric atmosphere and had our sights on what was foretold as a grand coffeehouse to patronize. This aforementioned establishment was knighted Chestnut Hill Cafe, a coffeehouse said to be serving Counter Culture Coffee and pulling splendid shots of espresso. Taking advantage of the free street parking, we sauntered over to their corner brick building, complete with a full patio of seating amidst a lovely array of trees. 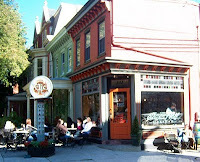 Within, the coffeehouse is outlined with copper, blacks and grays in a swanky arrangement of furniture and surrounded by numerous, beautiful windows. I stepped up to their sizable bar and ordered an espresso (they used Counter Culture's Toscana) and a drip of their 21st de Septiembre from Mexico. The drip imbued notes of honey, strawberry candy, cherries, granola, daffodil greens and a little chicken broth; a pleasant coffee with a light-to-medium body. The espresso,pulled short with a marbled crema, was also delectable, holding facets of bitter cocoa, nutmeg, sweet lemon, a touch of honey and cinnamon. The tea was free leaf. Finishing our beverages, we walked out into the toasty afternoon sun pleased with our experience. If you happen to be in Lancaster, make a stop at Chestnut Hill Cafe. Hello, well written post apreciated very much,I think we could became blog palls lol! Love Lancaster, PA! I have never been to this particular cafe though. I will have to check it out next time I am in the area.